September is National Yoga Month. 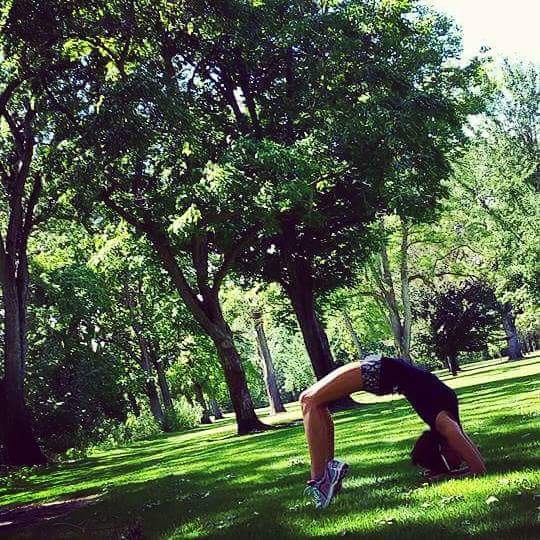 Our guest blogger, Sarah, finds her daily moment of peace by practicing yoga. Check out how yoga has brought peace and balance into Sarah’s life. Far too often we seem to get caught up in the stresses life brings. Family, work, self-doubt, money… everything. Have you ever had a moment in your life when all of these factors seem to be taking control of your happiness? A moment when you just don’t think you can take any more negativity or stress? That exact moment for me was about a year ago. I was moving to a new state where I knew only one person. I had been there for one day and was already stressing about finding a job, whether or not I could afford to live off my savings for who knows how long… I needed an escape. Something to make me feel a little less stressed and, more than that, something to make me feel confident in all life had to bring. I stumbled upon a Yoga hashtag on Instagram and instantly fell in love with the practice. Whether you are a beginner, experienced, advanced, or just looking to try something new—Yoga is a practice that welcomes all levels, ages, and mind sets. I started by doing the basic stretching like Downward Dog, Upward Facing Dog, really basic things. And I LOVED it! Not only does Yoga help with balance, flexibility and muscle strength, it helps with stress. Taking 10 to 20 minutes a day for the past year has improved all of those areas for me, but most importantly, it has given me the ability to wake up every morning and feel. 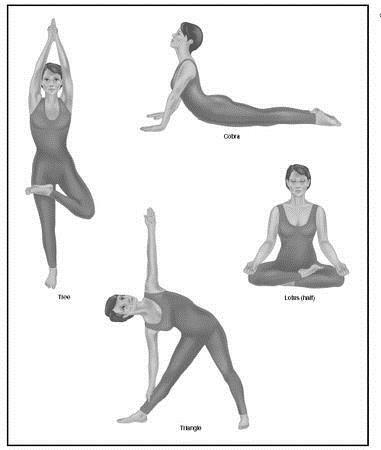 Below is a chart for basic Yoga stretches. I would suggest to anyone to take at least 10 minutes out of your day if you are feeling stressed to give these a try. Focus on your breathing, on your mind, and if possible, let any worry you have drift away (as cheesy as that sounds!) for that 10 minutes. If you continue to practice this each morning, each night, or whenever you have a bit of free time in your day, you may just find that your stress in everyday life improves. I truly believe that this is one of the most incredible ways to exercise your body and your mind. It has helped me in ways I never imagined were possible. Practice does NOT make perfect. Practice makes progress—and how amazing is it that something can give your body and your mind progression?! 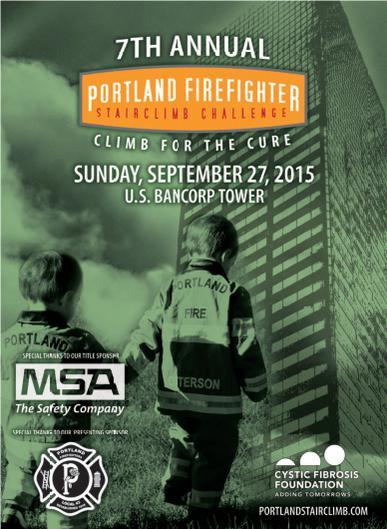 On September 27, firefighters from across the land will congregate at the US Bancorp Tower in Portland to test their endurance and raise money for cystic fibrosis research by climbing the 40 floors in full gear. Looking to maximize the calories you burn each day? Don’t skip steps. You burn more calories by touching each step, not skipping every other. You may feel great as you quickly gain altitude, but the added difficulty of each step (while skipping steps) doesn’t outweigh the total calories you would burn if each step is taken. Going down stairs also burns calories, but at a lesser pace. Though, including the descent will work out a different set of muscles, and will improve your coordination. First off, elevators are stuffy and awkward. Second, if you are traveling less than five floors, on average, taking the stairs is faster. And third, you’re missing out on the benefit of burning a few calories. Looking for a vigorous activity without paying for equipment? Then find a set of stairs to climb and get your heart rate up! According to Livestrong, a 140 pound person will burn around 99 calories climbing seven floors of stairs. Though, the heavier you are, the more calories you burn. Which brings us back to the firefighters. Thank you for taking on the 40 floors with 55 pounds of gear, and breathing through your air tanks (which we hear is like breathing through a straw). The endurance needed to carry the extra weight is impressive, and we are grateful for it! Not only do you keep your bodies in physical shape to serve our community, but you have made this physical activity enjoyable while supporting research for cystic fibrosis! We all remember September 11th in different ways. What I remember most is how Americans came together to do whatever they could to help support one another. First responders headed to Ground Zero, hotels offered shelter to those who couldn’t get back to their Manhattan homes, and complete strangers stood hand in hand comforting each other. All of a sudden this great nation, that spans over 2,000 miles, felt more like Mayberry. On the anniversary of the September 11th attacks, Americans from coast to coast can unite again for September 11th National Day of Service and Remembrance. You can volunteer at your favorite charity, donate to a local foodbank, or simply open a door for strangers that have their arms full. 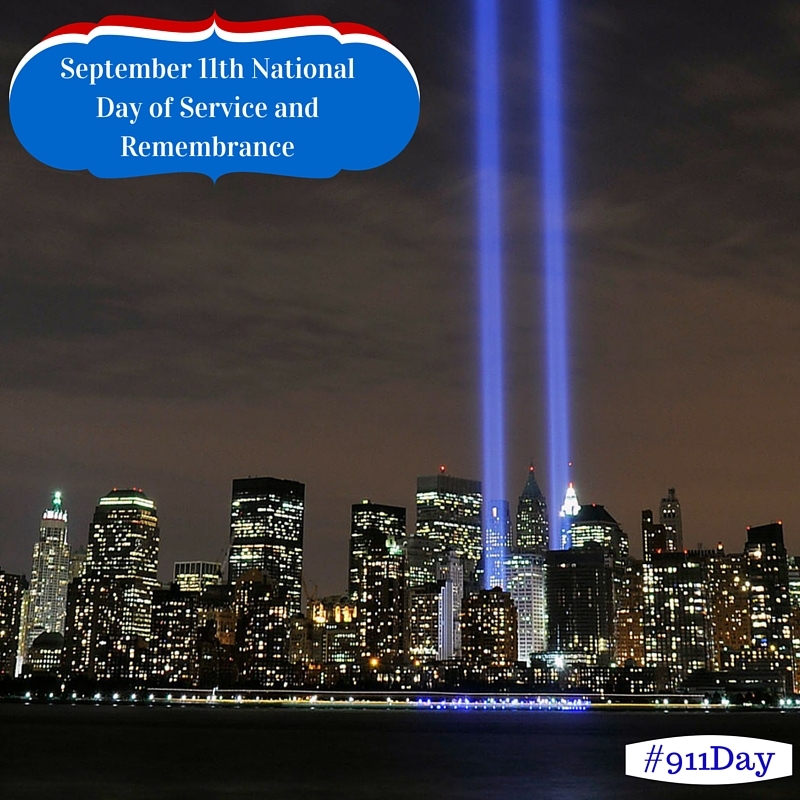 Click here to learn more about September 11th National Day of Service and Remembrance and how you can become involved.